The former Buehler’s Fresh Foods location at 800 W. Central Ave. in Delaware will soon house Planet Fitness, the health club announced last Thursday. 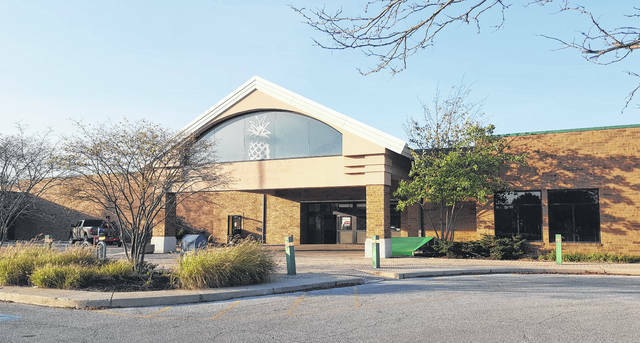 Ever since Buehler’s Fresh Foods in Delaware closed its doors in February 2016, rumors have swirled regarding possible tenants for one of the largest retail buildings on the city’s west side. Last Thursday, Planet Fitness franchisee Mark Christie put the rumors to rest by announcing via a press release that the health club is expanding to Delaware and leasing 22,000 square feet of retail space inside the former grocery store at 800 W. Central Ave.
Christie, who owns the Marion Planet Fitness and is managing partner of the group opening the Delaware franchise, said the group has had its sights set on Delaware for the past three years, but couldn’t find the right size location that also had adequate parking for a gym. The feeling from the city’s side is mutual. He added with Planet Fitness only leasing 22,000 square feet, the building will have approximately 42,000 square feet available for future tenants once First Commonwealth Bank leaves the site for its new location currently under development in front of the former grocery. Christie said in addition to the $10 monthly fee, members are required to pay a one-time annual payment of $39 along with an enrollment fee. For a limited time, the Delaware location will be offering a $1 enrollment fee for those who register during a special promotional period beginning next month. Starting Nov. 6, Planet Fitness will open a presale office at its new location for anyone interested in a membership or learning more about the gym, which is expected to open by the end of the year. He said members will get plenty of bang for their buck as he and his two business partners are investing $2.2 million in the Delaware franchise, which includes construction of a new storefront and entrance to the building. The Delaware Planet Fitness will be open and staffed 24/7 and will feature over 100 brand new cardio machines, new fully equipped locker rooms with day lockers and showers, two massage chairs, 28 full-size flat screen televisions, a 30-minute express circuit and PF 360 station, two HydroMassage beds, five tanning beds, three tanning booths, and a Total Body Enhancement booth. For more information or to join online, visit www.PlanetFitness.com.